TVS Motor Company, India’s leading two wheeler maker, today launched the new ‘Chocolate Gold Edition’ of the 2016 TVS StaR City+ motorcycle. Adding to its style quotient and superior engine performance, the new variant will provide a premium look and also cater to the popular colour preference of motorcycle buyers. The Chocolate Gold edition of the TVS StaR City+ will be available along with other premium colours like Matte Titanium Grey Edition and the attractive Gold Edition model. We’re proud to launch the premium, new variant of TVS StaR City+ in a captivating combination of gold and Matte Chocolate brown. The new Chocolate Gold Edition leverages the popularity of the matte brown colour while taking the ante of style further up with gold, to provide a stylish yet bold look to the motorcycle. We believe colours are a testament to the rider’s personality and play a significant role in the purchase decision. With this new edition, we aim to reach out to the stylish yet pragmatic riders who are looking for a dash of style in their ride experience. said Arun Siddharth, Head of Marketing – Motorcycles, TVS Motor Company. Ever since launch in 2014, TVS StaR City+ continues to be a popular choice among two wheeler buyers. The new Chocolate Gold edition of the motorcycle is a combination of gold, brown and tan. The gold alloy wheels in this new variant add to the superior look of the motorcycle. 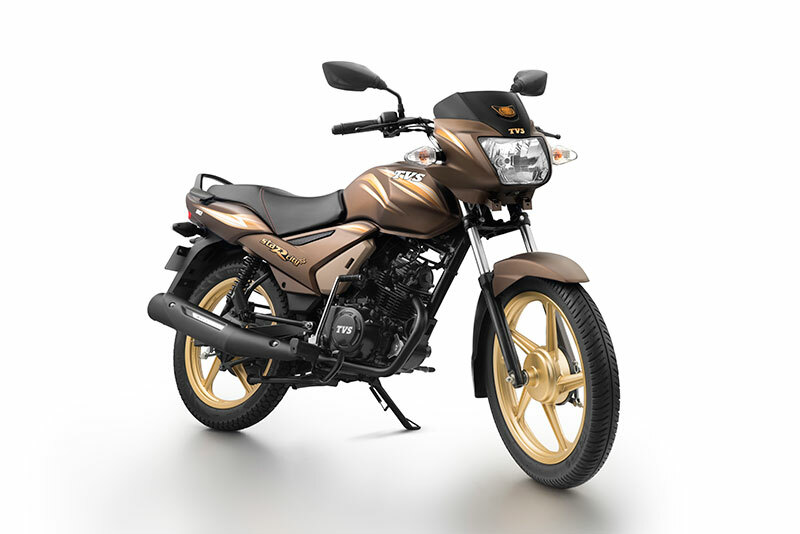 The new Chocolate Gold edition of TVS StaR City+ will come with the same tried and tested 109.7cc power engine which is an ideal combination of smooth performance, power and fuel economy. Powering the TVS StaR City+ is a 110cc single-cylinder air-cooled engine that can churn out 8.30 bhp at 7,000 rpm and 8.70 Nm of torque at 5,000 rpm mated to a four-speed gearbox. Other features of the Motorcycle include digital fuel gauge, long wheelbase, wide rear tyre and an analogue speedometer. The Special Chocolate Gold Edition TVS StaR City+ is priced at Rs. 49,234(Ex-Showroom Delhi) and is currently available at select TVS Showrooms across the country.